Kausik Mukhopadhyay is an artist based in Mumbai. He has a B.A (Visual Art) from Rabindra Bharati University, Calcutta and a M.A (Fine Arts) from Viswa Bharati University, Shantiniketan. He has held fellowships at the Kanoria Centre for Art, CEPT, Ahmedabad and the Inlakhs Foundation. 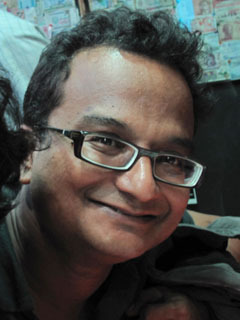 He currently teaches at the Kamla Raheja Vidyanidhi Institute for Architecture and Environment Studies.